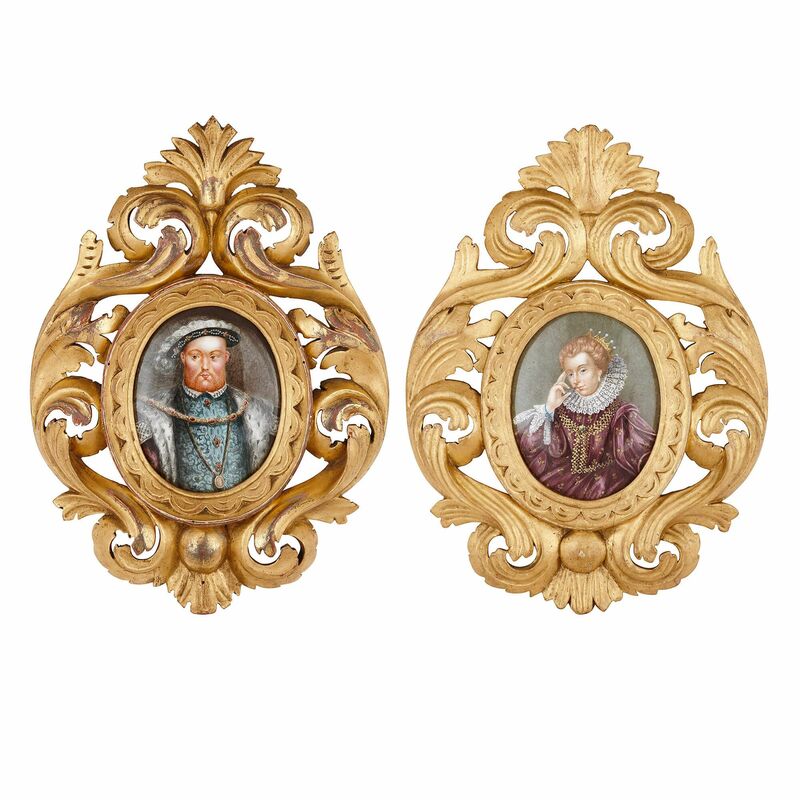 Painted in Limoges in the 19th Century, these two enamel plaques are exquisite pieces of Royal portraiture, including a fine depiction of King Henry VIII. These Royal portraits of a King and Queen are both half-length and oval in their format, and framed within elaborate giltwood frames, which are carved with scrolling, foliate forms. 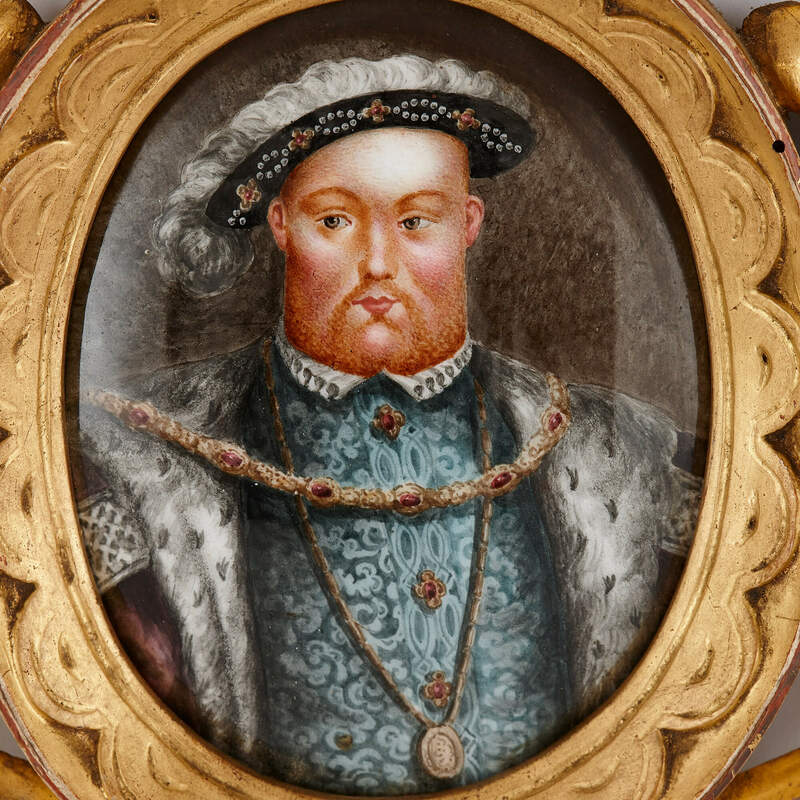 The first painting depicts the famous Tudor King of England, Henry VIII. Its composition is based on the iconic, and now lost, portrait of the English, Tudor king by the court painter, Hans Holbein the Younger. This full-length portrait was created in 1536-37 as part of a larger mural depicting the Tudor dynasty at the Palace of Whitehall in London. Henry VIII encouraged artists to copy Holbein’s portrait of him, and he gifted versions of it to people he was close with and to Ambassadors, helping to spread his image across the globe. It is partly because of this that the portrait became so iconic. 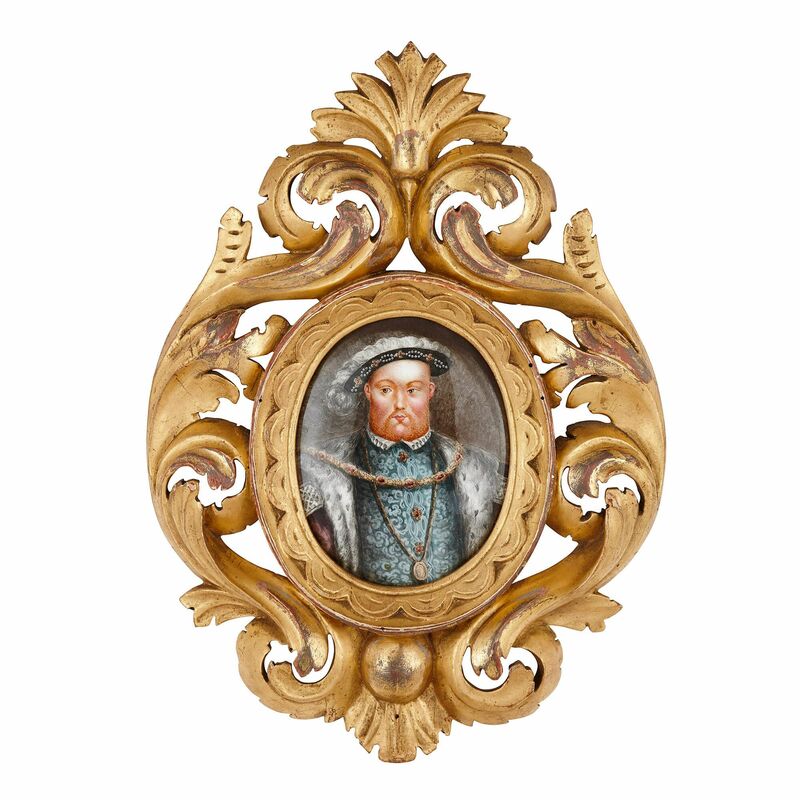 In this enamel painting, Henry VIII faces the viewer front-on and looks out at us directly. He wears a beaded hat, featuring with a large white ostrich feather. He is dressed in a turquoise-coloured, patterned doublet, with a small white ruff, and large fur-lined overcoat. A pomander hangs around his neck, and a jewel-heavy necklace drapes across his broad shoulders. 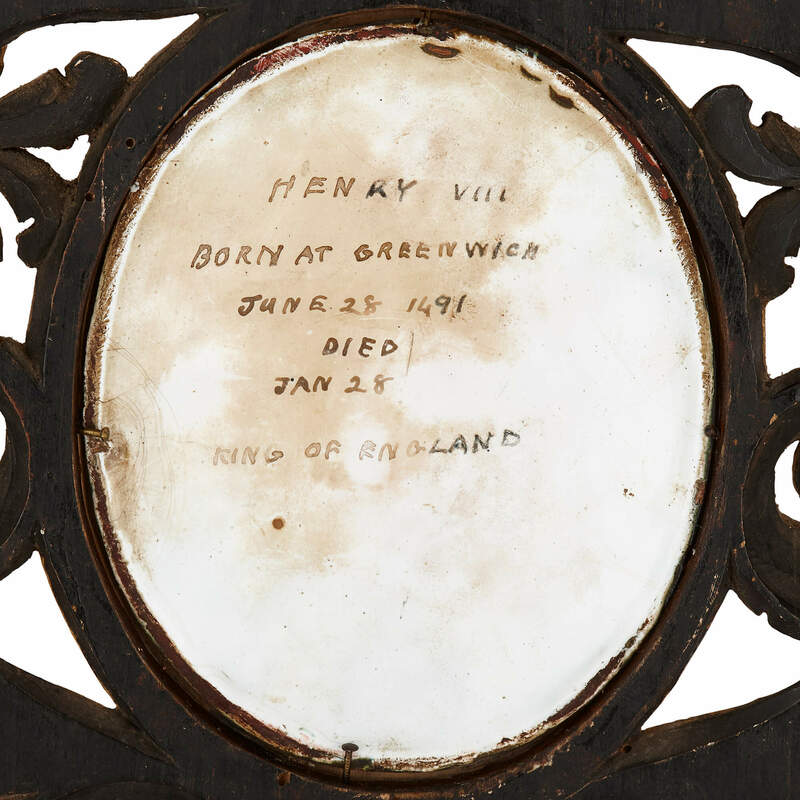 The back of the painting is inscribed, 'Henry VIII / BORN AT GREENWICH / JUNE 28 1491 / DIED / JAN 28 / KING OF ENGLAND'. In the second portrait, the identify of the sitter is less clear. 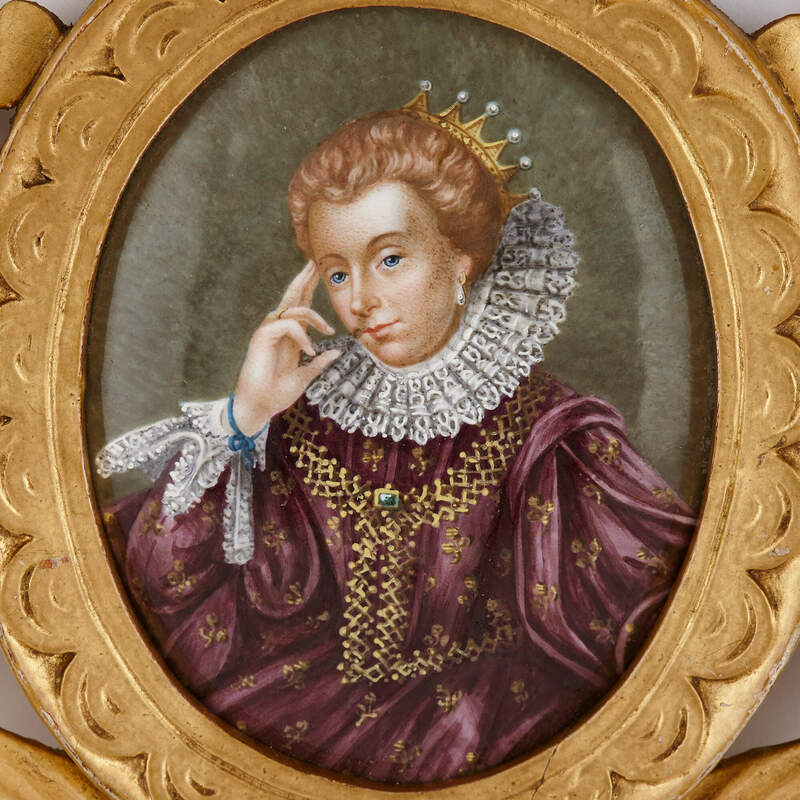 The woman is dressed in a fine purple gown, with lace trimmings, a bejewelled gold necklace, and an elaborate lace ruff. She has blonde hair, which is tied back, and blue eyes, which gaze out at the viewer. Her right hand is raised to her face, with her fingers touching her temple in a thoughtful pose. 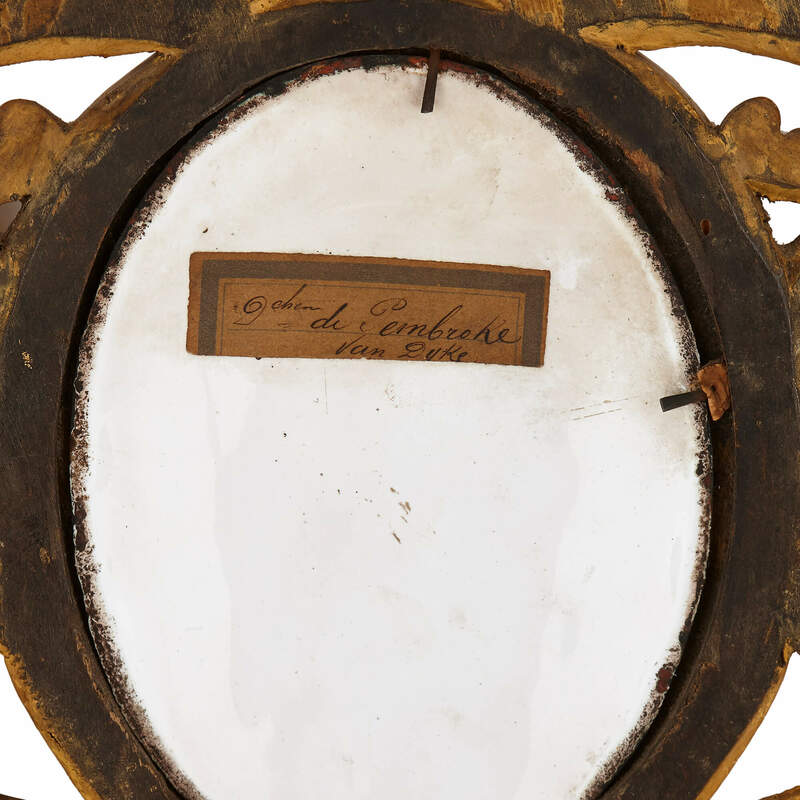 The back is indistinctly signed, '_ du Pembroke / Van Dyke'. Considering that the woman is crowned and paired with a portrait of Henry VIII, it is tempting to think that she might be one of the Tudor king's six wives. Anne Boleyn, for instance, was given the title of the Marquess of Pembroke by Henry VIII, so it may be her depicted. 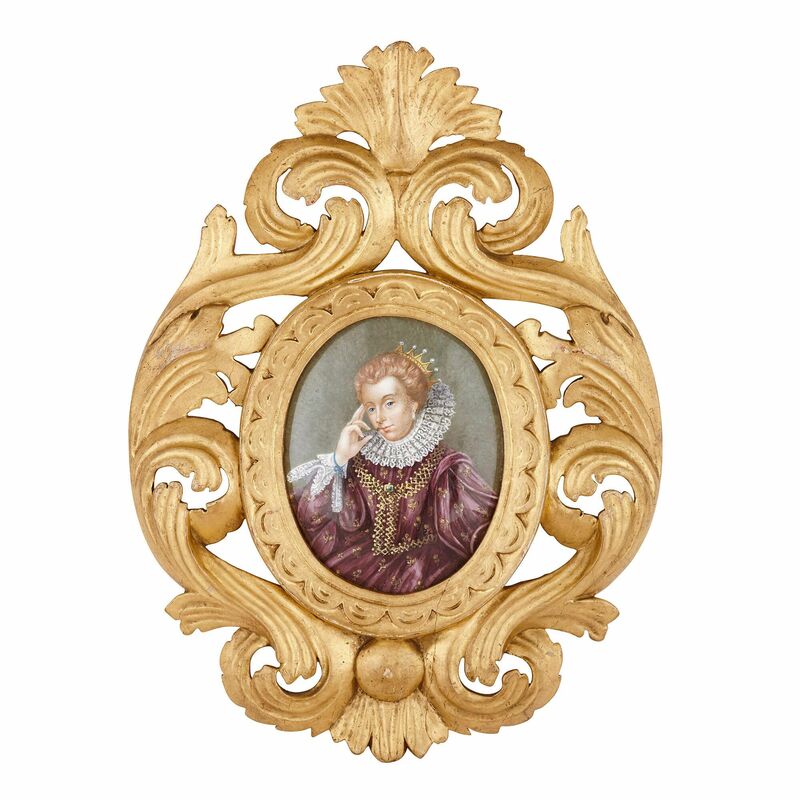 This might also explain the presence of the fleur-de-lis on the woman's dress, since Anne was well connected with the French court. The queen may also be Jane Seymour, who was fair-haired, as this woman is. Either way, it is unlikely that the painting is after Anthony Van Dyck, because he was active in the English court much later than the Tudor period. The inscription on the back of the plaque is therefore most likely a misattribution made at a later date.